TV Wall Bracket Mounts - 50" to 60" - Ships Same Day! Use these TV bracket wall mounts to attach your flat screen television to a wall easily! The flat panel TV holder has a slim 70mm profile, with a level built-in to the frame to ensure the display is straight and will properly support your flat panel television once installed. The hanger is made from steel with a black powdercoated finish for style and durability. Whether displaying a pub, office, home, or lobby, this mounting bracket will securely hold the TV in place using a minimal design that is sturdy to last for years to come! The mounted television brackets, TV bracket wall mounts are designed to hold 50" to 70" flat screen TVs that weigh less than 58.5kg. 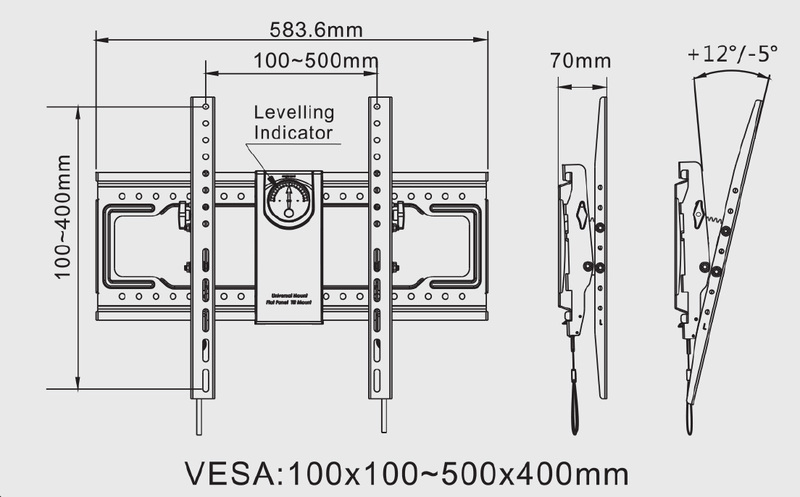 The universal design of the mount is VESA compatible for 100 x 100mm through to 500 x 400mm, easily working with most standard makes and models of televisions. The arms make angling the screen easy too, with between -5° and 12° of tilt to ensure the screen is easy to view no matter where you place it on the wall. Quick release straps on the arms make mounting the screen easy after attached to the back of the TV. 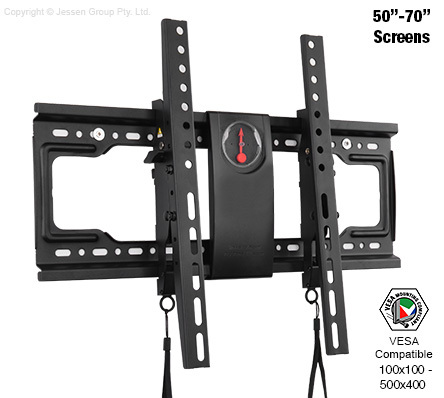 These straps let you and a partner lift the screen onto the bracket once securely installed onto the wall, and then pull the straps to engage the arms on the mount tightly to prevent it from slipping off. The included hardware kit is designed for use with most wall surface types, though you should check with a local professional if unsure it is appropriate for your need. Order today by 2pm EST from Slimline Warehouse to receive same day despatch on this and most other in stock items to anywhere in Australia!